The Free State National Botanical Garden dates back to 1965. During the 1963 Kirstenbosch Jubilee Year Tour it was decided that the Free State warranted a botanical garden for the cultivation and display of the varied flora of the province. Several sites were investigated in the city centre, on the slopes of Naval Hill, part of the farm Brandkop and the farm Winter Valley, about 10 km from the main post office. The last-named site was the most suitable and it was purchased in 1965 by the Bloemfontein city, which transferred control to the Trustees of the National Botanical Gardens. The State President Jim Fouche, officially opened the Garden on 22 February 1969. He marked the occasion by planting an Olea europaeasubsp. africana tree which can still be seen. Since then the Garden has been used extensively for research purposes by university students, schools and ecologists. It has also been visited by nature lovers who come to stroll and enjoy the biodiversity in this peaceful setting. The Garden also has a magnificent specimen of the wild olive (Olea europaea subsp. africana) thought to be over 200 years old. 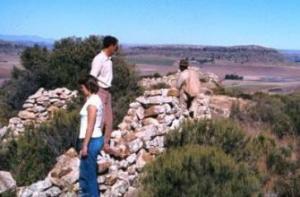 Early in South African history this site was inhabited by Iron Age Basotho dwellers. Remains of their pottery have been found and are displayed in the Education Centre. South African wars have left their mark on this site too. British troops were stationed in the vicinity during the South African War (1899-1902).The dam was built to hold water for their horses and the stone wall can be admired to this day. Monk’s Head beacon, 1436 m above sea level, and an old stone wall marks a British patrol path used during the war. Piles of horseshoes, found near the nursery complex, indicate that it might have been the site of a farrier’s shop. Half a century later, the curator’s house was built by Italian prisoners of war during World War II. It was perhaps used as a hospital for the prisoners of war. Also to be seen in the Garden is a fossil tree trunk (Dadoxylon arberi) from the Harrismith district, which is estimated to be 150-300 million years old. Visit PlantZAfrica, SANBI’s plant information website, for more information on plants in our garden.